Every week when my blog goes out, I’ll get an email from my Dad. Aside from the spelling and punctuation which, as an ex-publisher, he always picks up on, the messages range from complimentary to longing: ‘looks delicious’, ‘definitely not on my diet!’, ‘reminds me of our trip to X’ or ‘I wonder if your mum might make me that.’ Dad, I’m afraid to say this definitely falls into the ‘not on my diet’ category. Everyone else, if you’ve given up sweet stuff for Lent you might want to look away now . . . I struggled to come up with a title for this recipe. Luke and I spent several minutes tongue twisting around various riffs on chocolate, peanut, caramel, ice cream and pie and I still don’t know that we nailed it. It’s tricky to sum up in one sentence all the sugary goodness of a crunchy biscuit base, salty peanut caramel, smooth peanut butter ice cream and melting chocolate ganache. In fact I’m not sure a sentence could ever sell it better than the satisfied silence its consumption elicited around the dinner table followed by appreciative ‘mmmnns’, the licking of plates and requests for seconds. What I think I’m trying to say is that you really need to make this pie. The recipe is inspired by Ashley’s Chocolate Pecan Ice Cream Pie, which I knew I needed to reinvent in peanut butter form as soon as I tasted it. 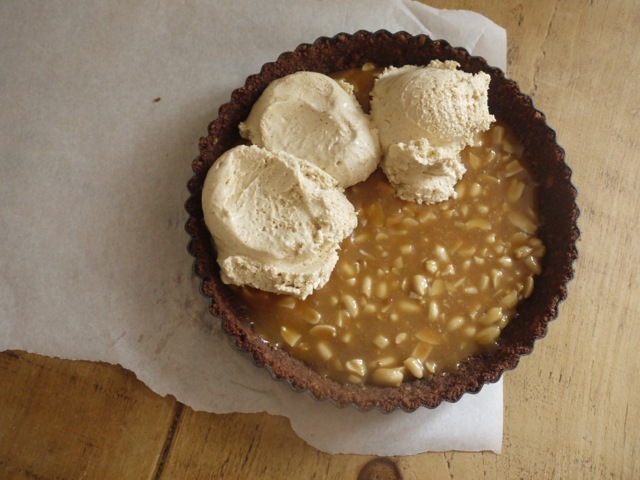 There’s something about that Snickers-like combination of peanuts, caramel and ice cream that I find utterly irresistible and this pie is possibly my all-time dream dessert. 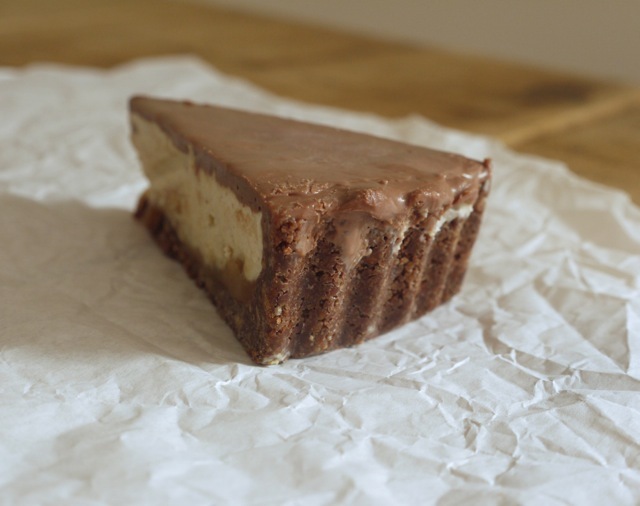 Not only does it taste incredble, but using a chocolate biscuit base and covering the top with a layer of ganache makes the whole thing look like a giant peanut butter cup, which is endlessly pleasing to my inner child. The instructions below look fairly lengthy but please don’t let that put you off. There are no tricky techniques here – not even any baking – and if you don’t have an ice cream machine (or want to speed things along) you can use good quality ice cream from a tub instead of making your own. I imagine a hazelnut variation (both ice cream and caramel) with Nutella ganache would also be epic. Not diet-friendly, perhaps, but nothing a few extra portions of greens over the week can’t cancel out (that’s how it works, right?). With its crisp biscuit base, salty peanut caramel and ice cream and smooth chocolate ganache, this is an incredibly indulgent dessert. Perfect for dinner parties with friends and family or simply because. 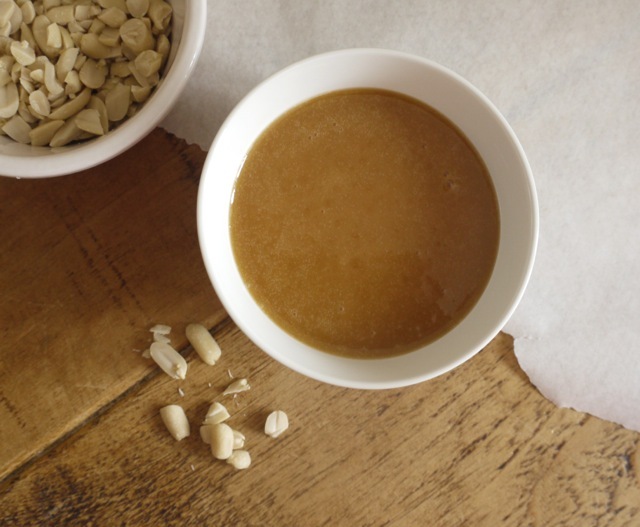 Start by making the caramel. In a small saucepan combine the sugar and syrup over a medium heat. Swirl the pan but do not stir. When the mixture is a copper colour, take off the heat and slowly whisk in the cream. Add the butter and salt, whisk to combine, then stir in the peanuts. Lightly grease a 23cm loose bottomed tart tin with butter and line the base with baking parchment. 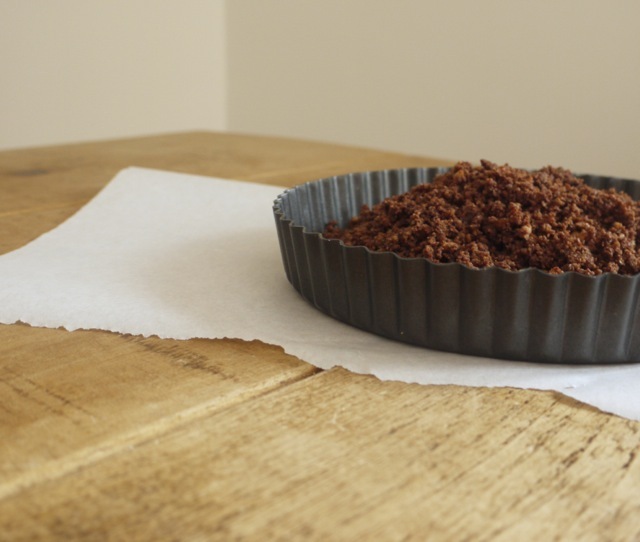 Blitz the digestive biscuits to crumbs in a food processor. Melt together the butter and chocolate then stir into the biscuit crumbs. 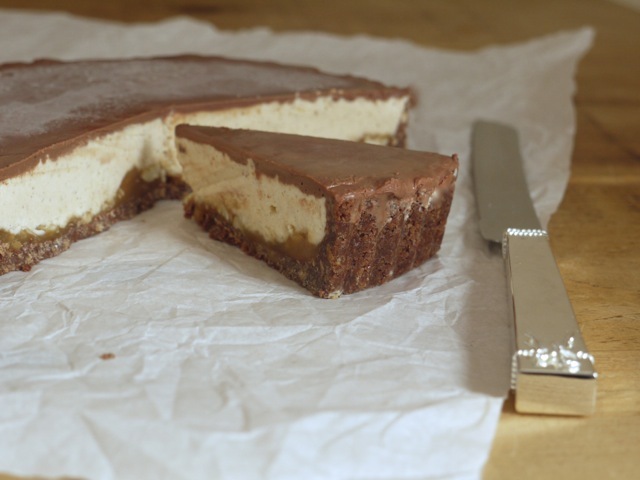 Press the crumbs into the base and sides of your prepared tin then pour the peanut caramel over the bottom. Refrigerate while you make the ice cream. In a food processor, blitz together all the ice cream ingredients. Churn in an ice maker according to your manufacturer's instructions. Once churned, transfer the ice cream to the tart shell and smooth flat. Freeze for one hour. When one hour is up, make the ganache. Combine the cream and chocolates in a small pan and melt over a gentle heat, stirring until smooth. Allow to cool for a few minutes then remove your ice cream pie from the freezer and pour the ganache over the top. Return to the freezer for at least one hour. Allow to soften slightly before serving in thin slices. Will keep in the freezer for at least a week. Yep, I need to make this pie. Probably when we have guests, so I don’t eat it all myself. 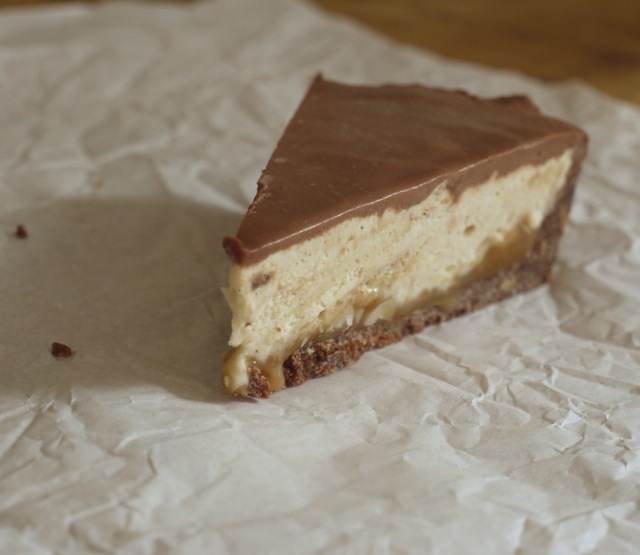 Not had a Snickers for years, but used to love that flavour combination, so done right, home-made, looks amazing. I’ve not had a real Snickers in years either, but homemade? Somehow that’s allowed and it tastes SO GOOD! So I made it. Delicious. I did the ice-cream by hand-churning it as it froze, and it worked fine. The ice cream alone is a great recipe. I think I cooked the sugar a bit too long making the caramel, so it was a bit hard when it set. Still got some on the freezer, and I’m the only person in the house atm, so I suspect I’ll be hitting the calories big time later…. I think you may have just come up with my absolute dream dessert! This looks wonderful. I can’t get enough of the salted peanuts/peanut butter and chocolate combination at the moment, and ice cream too? Heaven! I’ll defiantly have to give this a go, diet be damned!! This is perfection I love all things peanut butter and this is making me drool. Delicious. This is such a stunning pie! Decadent, beautiful and sounds delicious! I can’t wait to try it out! Thank you for sharing this great recipe. I’ve not made much ice cream, and don’t have a machine, but do you think your ice cream recipe would still work with the manual churning technique? Taking it out of the fridge every half an hour and stirring it? It would take longer but would it be okay? I do prefer the idea of making it all from scratch. 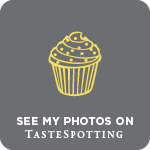 This blog made me laugh.. it was like reading a replica of me! My dad reads all my posts before they even get published online as he is a grammar fiend! And each time when I send them to him, he always replies with a little comment like.. ‘ your mum would never let me eat that one’ or ‘can I come over please and I try it’ or he’ll give me a gold star if I make no spelling mistakes! The recipe and photos as always sound just amazing and I’m trying to work out when I can make it for someone.. this Sunday might work with mum and dad over for lunch, he’d be very pleased indeed! I am completely in love with this, and, can’t wait to own my own book of classic treats that you’ve created! This makes me so excited! I feel like this sort of thing would go down so well after a homemade curry – may have to try it out this weekend, but without the homemade ice cream (which is a big shame) as I find the machines are all faddy unless you shell out hundreds on a Cuisinart! Oh wow, this just got put on the to-do list. My husband absolutely loves those Snickers ice cream bars and I already know this homemade pie will far surpass them! Oh wow, this ice cream pie is all kinds of wonderful! Snickers was by far my favourite chocolate bar growing up and I still have a soft spot for anything involving peanuts, caramel and chocolate! Talking about inner children, my inner child is squealing with delight right now! OMG YOUR DAD!! He sounds like my dad. And hello, you had me at giant ice cream and then when I read peanut butter cup and pie, I about died. Sounds/looks amaze!!! Whoa. I would do most anything for a slice of that glorious dessert right now. Insanely delicious-looking! My favorite pie of all time! I love it! Ha, there will definitely be some chocolate peanut butter-risqué treats going down!